I spent hours in front of the computer creating the penny template to make the process easier for myself and I’m so glad to be able to share it with you. Since 2012, I’ve had a lot time to reflect on the choices I made. I’ve also gotten a TON of questions from others who have tried their hand at this project. I want to give you answers to some of the questions I know you have been mulling over in your head. So, I’ve compiled an FAQ document with all of the major questions I’ve received along with my answers. Hopefully this will give you the confidence you need to get started on the right foot. Getting ready to start your penny project? I know you’ve got questions and I’ve got the answers for you! 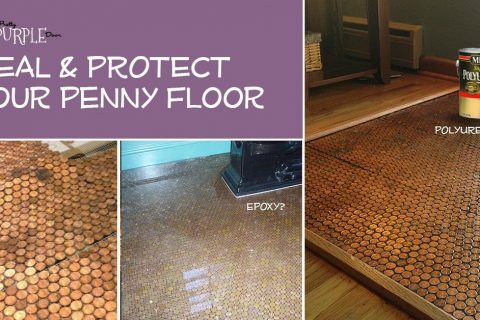 Do I NEED the penny floor template to complete this project? 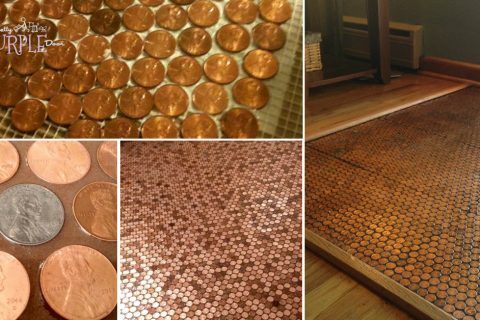 Use your floors while setting your pennies onto mosaic sheets. Avoid the back-breaking work of being hunched over pushing pennies into the floor. Work at your own pace building easy to manage 1x1ft mesh sheets of penny tile. Work on nights or weekends if you want. 5 page instruction guide included. How has your floor held up since 2012? Hey Chris. The poly has held up really well. I have not refinished it although refinishing would be easy (just sand and re-apply). There are areas of wear but it works for me. None of the pennies have been damaged. I hope that helps… poly is the safest way to do it and the easiest to reapply/refinish down the road. I would certainly do it again. PS: scroll down and you will see a gallery of my penny floor over the years. I also added a video created in January 2018 showing the details of my floor, so check that out too. Will the template work for US pennies and UK pennies? How long should I wait before we begin to walk on the floor? I don’t want to take a chance using epoxy and messing it up... should I? I can’t speak for everyone, but I would not use the epoxy… for the exact same reason. I was afraid to mess it up. So, I used Minwax Polyurethane for Floors and it turned out fabulous. If you don’t want to use epoxy… don’t. I am not sure who is forcing epoxy on you??? I didn’t use it, so you don’t have to either! I coated my floor with epoxy and now it looks like crap. What do I do? I’m sorry I can’t help with the epoxy. however, I’ve had the floor installed and sealed with polyurethane and walk on it every day. Even my 100lb dog trampled it, and now my 40lb dog. It gets a lot of use and I’ve never had an issue with the floor “wearing” where we walk. I was thinking of using [insert random sealer name here]. Will it work? Guys… I love you to death but I have no stinking idea if some random polyurethane, sealer or epoxy that you’ve researched will work. I only know that Minwax Polyurethane for Floors will work, because that’s what I’ve used. If you take a look at the comments section of the penny floor post, many have commented on other types of polyurethane or other products they have successfully used. However, I haven’t used them and I don’t give you advice about ANYTHING that I haven’t personally tried myself. Do I need to use grout? I would highly recommend grouting your floor for a few reasons. it will keep the dirt out from in between the pennies so you dont have to clean your floor with a toothpick every week. grout is pretty, and makes it look finished. Pick a nice color like a charcoal or a reddish brown. Do you need to use it? I suppose I can’t tell you what to do. I grouted my floor so I would recommend it but I can’t say with any certainty whether it would work without grouting. If you’ve done it this way, feel free to contact me and let me know how it worked out for you. Michael, I would recommend unsanded grout for the sheer reason it will be less likely to scratch the pennies. Are the gaps wide enough to actually hold the floor in place with grout? The penny floor template that you can download has the spacing set to the same exact spacing that I’ve used. There are a few things that come into play with holding the pennies down. the Weldbond glue that adheres the pennies to the mesh. The combination of all three will give you enough adhesion that your pennies will not “pop off”. Mine has been walked on since 2012 and I’ve NEVER had a penny come loose. I hope this helps! Can I put a penny floor in my bathroom or shower? I really, really, really would not recommend it. If you are putting this in an area that’s going to get soaked all the time…. you are asking to fail. The pennies can also get a little slippery when wet. With that said, there are a few of my followers who have successfully tiled their bathroom and shower floors. I cannot vouch for how well these projects have held up. I know that Carl used a high-gloss epoxy finish that he recommends (head over to his post to read about it). Since I haven’t put my penny floor in a wet environment and have not used epoxy, I’m going to stick to my “I don’t recommend this” answer. If I try it some day I will definitely fill you in! Can I do this outside, like on my back porch? Hi Colleen! I’m from PA too! I think outside would be a challenge. I have seen penny gazing balls for the garden that turn green and weathered with the rain, snow etc so my guess is that it would get that look to it. I also think it would get quite slippery outside. Maybe someone else has tried it that can give you some better advice though. Is a penny floor slippery? Hi Tracy, penny floors ARE slippery… in the sense that hardwood floors are slippery. The sealer I used was a polyurethane for hardwood flooring. It makes it as slippery like a hardwood floor — no more, no less. Please note that I can only vouch for using Minwax Polyurethane for Floors. I really don’t know how slippery epoxy or any other sealer would be to walk on. Will the penny floor scratch easily? I don’t really know how to answer this question. If you drag something along the floor, like a large stove, yes, you’ll probably damage the surface of the floor… meaning the polyurethane. You would probably then have to sand the floor and reseal it. If you are this concerned about durability then I wouldn’t really recommend doing a penny floor. It’s more of a conversation starter or accent flooring. Pennies obviously aren’t made to be flooring. Maybe you could do a penny backsplash instead? How do you clean a penny floor? You grout the pennies just like you would any tile floor then coat it with polyurethane. So you can clean it just like you would any other tile… Mr. Clean, mop and glow, swiffer, steam mop etc! Honestly I don’t really worry about what product I use when because it’s held up over so many years. But, if you are worried about damaging the pennies like Catherine and Ann, I would use whatever you clean your hardwoods with since the polyurethane is for hardwood flooring — maybe try a steam mop and then wipe it dry afterwards. 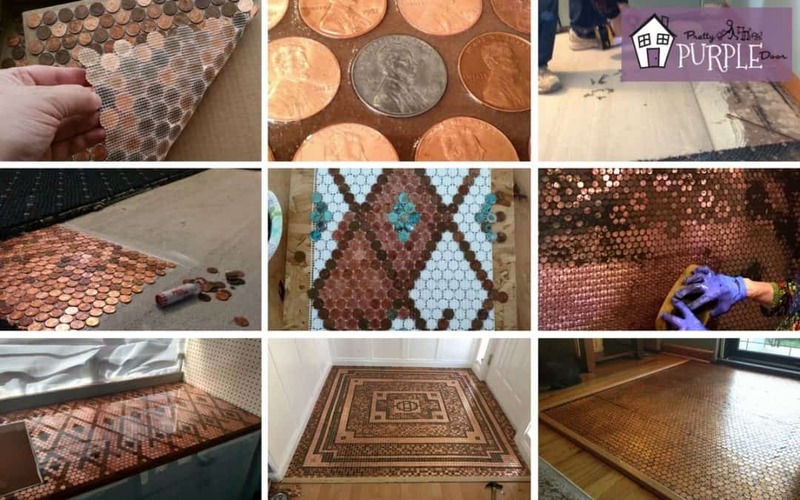 Is it legal to make a floor or other project from pennies? It’s absolutely legal to use pennies as a building material, or indeed for any other purpose for which you could lawfully use a plain disc of copper-clad zinc (other than to melt them down to recover the metal therein). It is immaterial whether the usage damages the pennies; it is perfectly legal to damage coins. What is illegal is to damage a coin, and then attempt to use the damaged coin to commit a fraud. 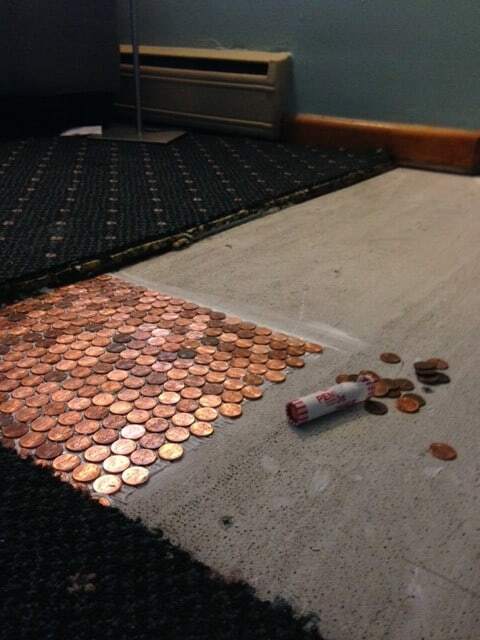 Tiling a floor with pennies is not inherently a fraudulent activity. Read the federal regulations here. Here’s a video I made of my floor in January 2018 — nearly 6 years after its been installed. follow the instructions I provide. If you have more questions head over to this thread to comment! How to seal your copper penny floor. 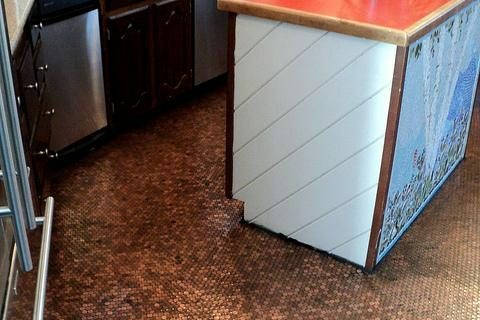 Product suggestions for epoxy and polyurethane you can use to seal your DIY copper penny floor. 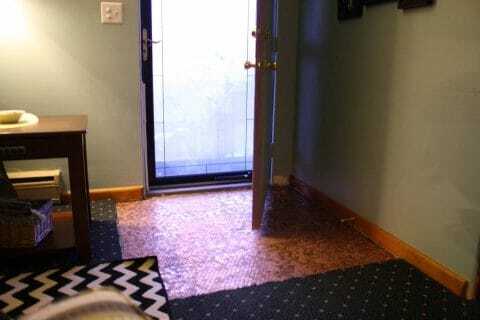 Copper Penny Floor Installation Tips. 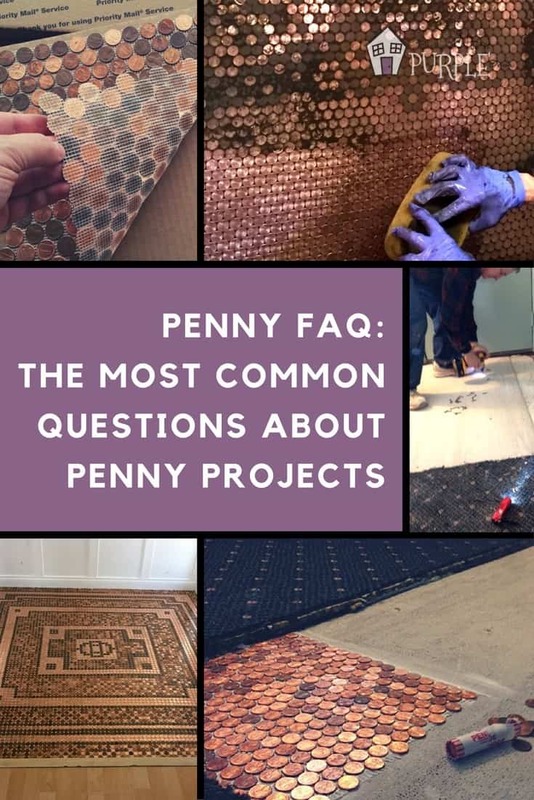 This post covers everything from prepwork, laying your penny floor, cleaning the pennies, grouting, and sealing your penny floor installation. Create a DIY mosaic on your floor. 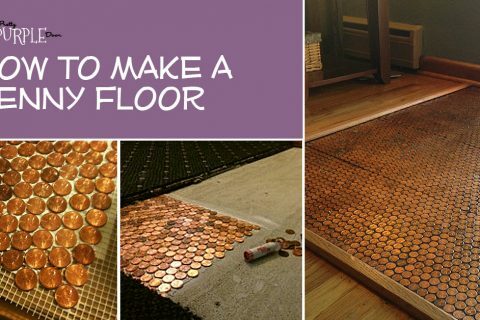 Thats right a DIY mosaic penny floor is our next do it yourself home owner project.